OHEMGEE! Pretty Little Liars is the show! Yes, another show that I watch often... Even though the show has taken a hiatus until January - that doesn't stop them from spilling a little here and there. And one of their main characters - Lucy Hale talks on who she'd like A to be. This is a mystery that we're all waiting to see unfold. 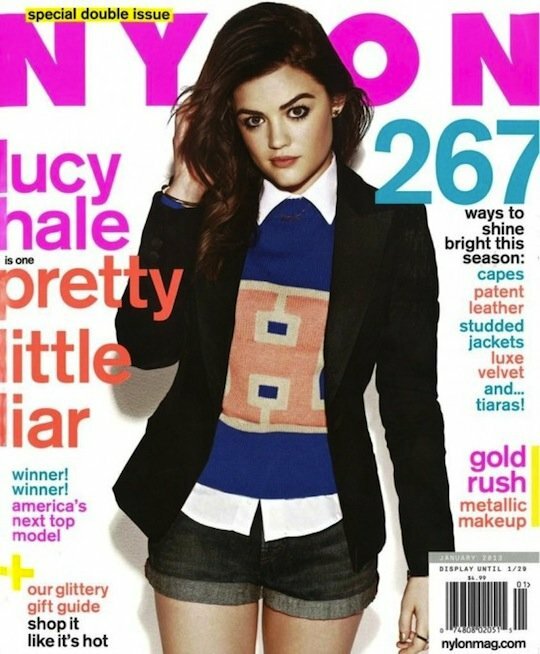 See what Lucy Hale had to say with NYLON magazine below. As well as the rest of the pics. On moving to Hollywood: I didn't have a friend for, like, two years[…] I've come out of my shell, but I was pretty shy. Some people take it as me being standoffish. On PLL fervent fans: [Shay Mitchell and I] got to the airport in Brazil and there were like 500 people there with signs and gifts. How did they even know we were coming? On making an album: It's absolutely terrifying. You only get one album. You only get one single. You get one shot in music. But I have a million different dreams. Why can't I go out and try to achieve them all? Who are you to say I can't? On the projects she'd like to take on next: I'm searching for something eye-opening. I love movies like 500 Days of Summer and Juno. Something offbeat without the glamour and the makeup and the clothing. On who she'd like A to be: I want it to be a Bonnie and Clyde thing. Where Aria and Ezra are in it together. Or Spencer and Toby. But something romantic, [where] you root for them [even though] they're the bad guys. That is definitely interesting! I look forward to seeing her pretty little face when Pretty Little Liars is back on in January.